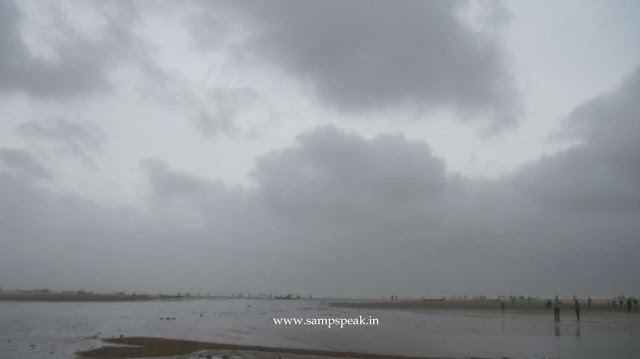 The cyclonic storm ‘Nilam’ intensified into a severe storm and made the landfall an hour ago – around 16.45 pm today. It was not Cuddalore or Pondicherry but earlier reports put the place as between Cuddalore and Nellore, which is quite a vast area – more importantly, Chennai city lies in between. There were reports that the Nuclear plant at Kalpakkam was put on high alert and the situation was closely watched as there was some anxiety of the plant withstanding a very high assault by the wind with velocity more than 160 kmph. Chennai corporation commissioner D Karthikeyan advised people to stay indoors – schools had already been closed, many Offices worked in the first half only and more permitted their employees to leave by 3 pm. Even before cyclone struck, trees were uprooted in many places. The fallen tree branches caused disruption to traffic – which were being removed very fastly by the Corporation workers with the help from local people. 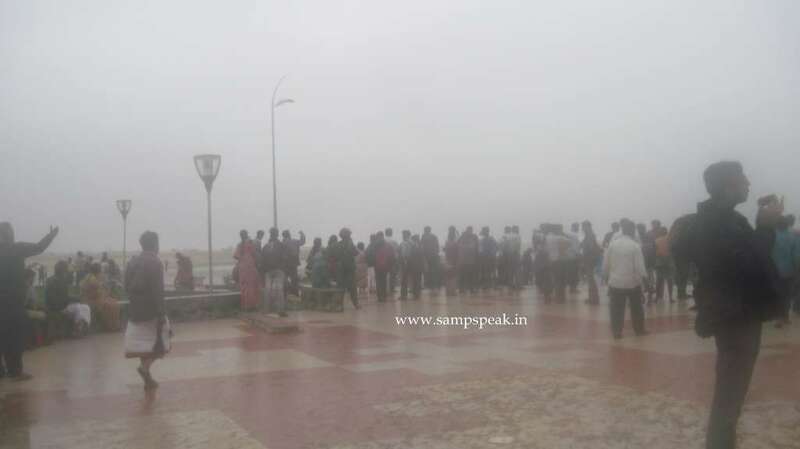 Now there are reports that the cyclonic storm Nilam crossed the shore and made landfall at Mahaballipuram, south of the Tamil Nadu capital at about 4.30 pm today. Mahabalipuram, derived from 'Mamallapuram' the 7th century port city of the South Indian dynasty of the Pallavas lies around 60 km south from the city of Chennai in Tamil Nadu. The name Mamallapuram is believed to have been given after the Pallava king Narasimhavarman I, who took on the epithet Maha-malla (great wrestler), as the favourite sport of the Pallavas was wrestling. It has various historic monuments built largely between the 7th and the 9th centuries, and has been classified as a UNESCO World Heritage Site. As the cyclone made landfall, windspeed went up to about 100 km per hour. Puducherry and south Chennai have been affected. Low-lying areas of Tamil Nadu like Chennai, Kancheepuram and Tiruvallur districts face the threat of inundation. Damages to property is not yet known. In Chennai, 282 schools will serve as relief centres. Community kitchens have also been arranged. 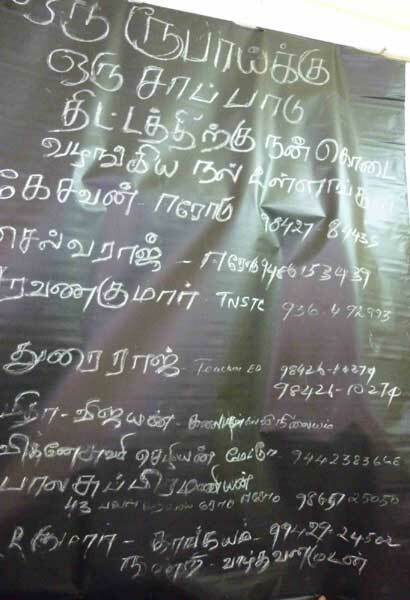 Cyclone shelters have been organised in Nagapattinam and Cuddalore districts with essential supplies. The government plans to send generators and sand bags to vulnerable areas in the districts. More rain fall is predicted in the coming hours. There are reports that after 5 pm Chennai Mass Rapid Transport System stopped its operations. At some stages, the system runs on elevated railway line, especially between Chepauk to Lighthouse are closer to the beach and the stoppage was in apprehension of strongwinds disrupting and overhead wires snapping. Today, Tamil Nadu Chief Minister Jayalalithaa reviewed the cyclone situation with her cabinet colleagues and senior officials and directed them to ensure all essential commodities are made available. She directed that a holiday be declared for all educational institutions in the coastal districts tomorrow and asked officials to take up relief measures, including providing affected persons food and shelter, besides evacuating citizens from low-lying areas. With regards – S. Sampthkumar # 17.20 hrs. Nilam Update : More rains - Cyclone Nilam moves closer..
Cyclone ‘Nilam’ has disturbed people for sure… at Chennai, this morning the Sun was out at last and the rain did stop - now it is raining still….. From a tropical Cyclone developing to a Cyclone, Nilam reportedly would not have the intensity of ‘Thane’ which devastated Tamilnadu and Pondy in Dec 2011. A tropical cyclone is a rotational low pressure system in tropics when the central pressure falls by 5 to 6 hPa from the surrounding and maximum sustained wind speed reaches 34 knots (about 62 kmph). The word cyclone has been derived from Greek word ‘cyclos’ which means ‘coiling of a snake’. The word cyclone was coined by Heary Piddington who worked as a Rapporteur in Kolkata during British rule. The terms "hurricane" and "typhoon" are region specific names for a strong "tropical cyclone". Tropical cyclones are called “Hurricanes” over the Atlantic Ocean and “Typhoons” over the Pacific Ocean. The Cyclonic Storm ‘NILAM’, moved northwestwards and lay centred at 0830 hours IST of today, the 31stOctober 2012 near latitude 11.00N and longitude 81.00E, about 260 km south-southeast of Chennai and 300 km north of Trincomalee (Sri Lanka). The system would intensify further into a Severe Cyclonic Storm and move northwestwards and cross north Tamil Nadu & adjoining south Andhra Pradesh coast between Puducherry and Nellore, close to Chennai by 31stOctober, 2012 evening. Under the influence of this system, rainfall at most places with heavy to very heavy falls at a few places and isolated extremely heavy falls (25 cm or more) would occur over north coastal Tamil Nadu and Puducherry during next 24 hrs. Rainfall at most places with isolated heavy to very heavy falls would also occur over south coastal Andhra Pradesh, Rayalaseema and north interior Tamil Nadu during next 48 hrs. Gale wind speed reaching 90-100 kmph gusting to 110 kmph would prevail along and off north Tamil Nadu, Puducherry and adjoining south Andhra Pradesh coasts during next 24 hours. Sea condition will be high to very high along and off north Tamil Nadu, Puducherry and adjoining south Andhra Pradesh coasts during next 24 hours. According to some other reports, Cyclone Nilam is expected to make a landfall this evening between Cuddalore in Tamil Nadu and Nellore in Andhra Pradesh, bringing in heavy rains in the region, with tide levels reaching 1.5 meters. 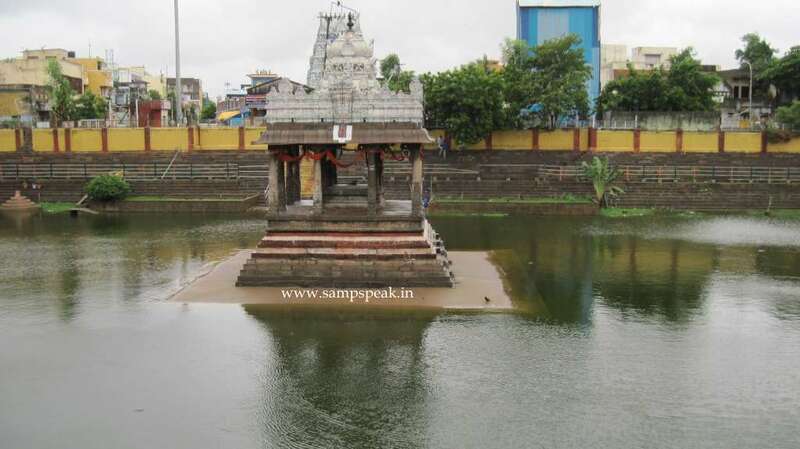 With regards – S. Sampathkumar @ 11:00 noon. 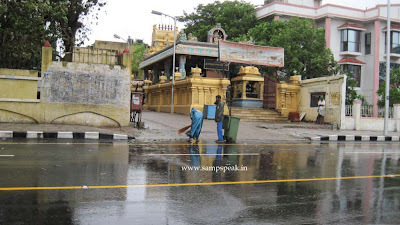 Whenever it rains, Chennai city struggles adding to the woes of its residents – there would be water stagnation, sewerage would be overflowing, no place to walk on the road, slow-moving traffic et.al., - still there are some good things too as found out this morning like the Temple tank of Sri Parthasarathi Swami at Thiruvallikkeni getting filled up; Corporation worker continuing with cleaning job here at Beach road. 31st Oct 2012. # 07.30 am. The city is bracing for Cyclone Nilam, which is likely to bring heavy rain and gusty winds that could reach speeds up to 65kmph. It has been raining continuously in Chennai and all parts of coastal Tamil Nadu. Not so good news - the deep depression lying 500 km south east of Chennai has intensified into a cyclonic storm. The intensified force now has a name - 'Nilam', [Sun TV had it as ‘Neelam’ – which in Tamil means blue; whereas Nilam in Tamil means land] as suggested by Pakistan under the cyclone naming procedure. Nilam is expected to move northwestwards and cross the coast between Nagapattinam and Nellore by Wednesday afternoon/evening. This cyclone is expected to be milder than Thane. 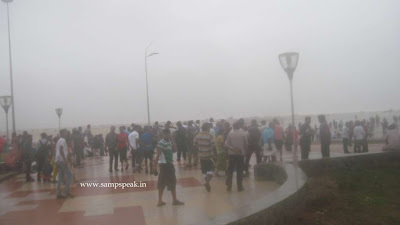 Thane hit the coast at 160 kms per hour; Met Department expects the speed squally winds of Nilam to be around 45-55 kmph gusting to 65 kmph. In Chennai Corporation schools and community kitchens are getting ready to be used as temporary relief centres. Schools have been declared holidays today and tomorrow, so did some Manufacturing units in the city. Chennaiites have to brace for heavy rains. By 5pm on Tuesday, the cyclone was 500km southeast of Chennai. It was stationary for more than 12 hours but started moving in a north-northwesterly direction, and is likely to cross the shore between Nellore in AP and Cuddalore in TN. There are fears that at the time of landfall, the speed of wind could get close to 90kmph. Warning signals have been put up at all ports and fishermen have been advised not to venture into the sea. Close on the heels of a review meeting chaired by Chief Minister J Jayalalithaa on October 20, all district collectors have readied relief camps for people evacuated from their houses. A battalion of national disaster response force and two battalions of the state disaster response force are in Chennai so that they can move to any part of the state in case of a crisis. The Cyclonic Storm ‘NILAM’, remained practically stationary and lay centred at 0230 hours IST of today, the 30 th October 2012 near latitude 10.00N and longitude 82.00E, about 400 km south-southeast ofChennai and 180 km north-northeast of Trincomalee (Sri Lanka). The system would move north northwestwards and cross north Tamil Nadu & adjoining south Andhra Pradesh coast between Cuddalore and Nellore, near Chennai by 31st October, 2012 evening. Under the influence of this system, rainfall at most places with scattered heavy to very heavy falls and isolated extremely heavy falls (25 cm or more) during next 24 hrs. Rainfall at most places with isolatedheavy to very heavy falls would also occur over south coastal Andhra Pradesh, Rayalaseema and north Interior Tamil Nadu during next 48 hrs. Squally winds speed reaching 50-60 kmph gusting to 70 kmph would prevail along and off north Tamil Nadu, Puducherry and adjoining south Andhra Pradesh coasts during next 06 hours. The wind speed would gradually increase thereafter as the system comes closer to coast, becoming 80-90 kmph at the time of landfall. Sea condition will be very rough to high along and off north Tamil Nadu, Puduccherry and adjoining south Andhra Pradesh coasts during next 36 hours. Storm Surge: Storm surge of about 1 -1.5 metre over the astronomical tide is likely to inundate the low lying areas of Chennai, Kanchipuram & Tiruvallur of Tamilnadu and Nellore district of Andhra Pradesh. Damage expected as cyclone approaches near the coast: Damage to thatched huts. Uprooting of small trees and breaking of tree branches and minor damage to power and communication lines. Storm is also expected to damage to crops like standing rice, groundnut and maize in coastal districts of Tamilnadu and rice and groundnut in coastal Andhra Pradesh. Action Suggested: Fishermen along north Tamil Nadu, Puducherry and south Andhra Pradesh coasts are advised not to venture into the sea during next 48 hrs. If you are wondering why ‘Nilam’ and how it belongs to Pakistan - Tropical cyclones have officially been named since 1945 and are named for a variety of reasons, which include to facilitate communications between forecasters and the public when forecasts, watches, and warnings are issued. Names also reduce confusion about what storm is being described, as more than one can occur in the same region at the same time. In the basin of North Indian Ocean (45°E – 100°E), a tropical cyclone is assigned a name when it is judged to have reached Cyclonic Storm intensity with winds of 65 km/h (40 mph). The names were selected by members of the ESCAP/WMO panel on Tropical Cyclones between 2000 and May 2004, before the Regional Specialized Meteorological Center in New Delhi started to assign names in September 2004. 31st 30th Oct 2012 @ 06:00 hrs. It has been raining continuously in Chennai and all parts of coastal Tamil Nadu. Not so good news - the deep depression lying 500 km south east of Chennai has intensified into a cyclonic storm and is expected to cross the coast between Nagapattinam in Tamil Nadu and Nellore in Andhra Pradesh on Wednesday, bringing in torrential rains in the region. Coastal districts of Tamil Nadu and Puducherry have been issued cyclone warning on Tuesday. One can recall the devastating effects at the start of the year or to be precise towards the last couple of days of the previous year – Dec 2011 – cyclone Thane struck Cuddalore, Pondy leaving at least 46 dead in Tamilnadu and Pondy and also causing large scale damage to houses, farm lands, industries and others. This cyclone is expected to be milder than Thane. Thane hit the coast at 160 kms per hour; Met Department expects the speed squally winds of Nilam to be around 45-55 kmph gusting to 65 kmph. Officials from the Ports of Chennai and Tuticorin have said that as part of safety measured they moved all the vessels from the Port to the anchorage area. 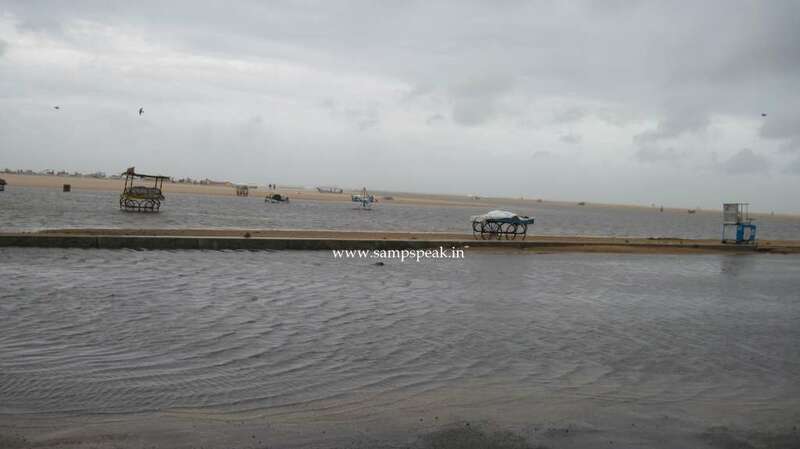 At Chennai port 12 vessels were moved from the Port to the anchorage area on Tuesday evening. Authorities from the Nagapattinam district, one of the worst hit areas during Thane cyclone, said that the each department including the police, fire and rescue services have been allotted specific work and they are geared up fully, 21 cyclone shelters are set ready. In Chennai Corporation schools and community kitchens are getting ready to be used as temporary relief centres. Schools have been declared holidays today and tomorrow, so did some Manufacturing units in the city. Chennaiites have to brace for heavy rains tonight also as the weather models indicate that the cyclonic storm is likely to move westwards and could cross north Tamil Nadu and adjoining south Andhra Pradesh coast between Nagapattinam and Nellore on Wednesday midnight. 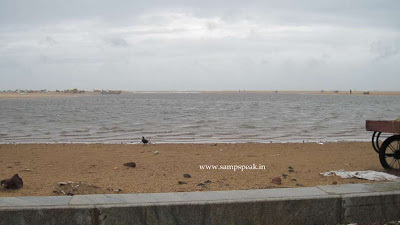 According to the Meteorological department, distant cautionary signal number one has been hoisted at Chennai port. This is the lowest among the signals, which indicates the potential cyclonic storm. If you are wondering why ‘Nilam’ and how it belongs to Pakistan - Tropical cyclones have officially been named since 1945 and are named for a variety of reasons, which include to facilitate communications between forecasters and the public when forecasts, watches, and warnings are issued. Names also reduce confusion about what storm is being described, as more than one can occur in the same region at the same time. The official practice of naming tropical cyclones started in 1945 within the Western Pacific and was gradually extended out until 2004, when the India Meteorological Department started to namecyclonic storms within the North Indian ocean. Before the official practice of naming of tropical cyclones began, significant tropical cyclones were named after annoying politicians, mythological creatures, saints and place names. Names are drawn in order from predetermined lists and are usually assigned to tropical cyclones with one, three, or ten minute sustained windspeeds of more than 65 km/h (40 mph) depending on which area it originates. In the basin of North Indian Ocean (45°E – 100°E), a tropical cyclone is assigned a name when it is judged to have reached Cyclonic Storm intensity with winds of 65 km/h (40 mph). The names were selected by members of the ESCAP/WMO panel on Tropical Cyclones between 2000 and May 2004, before the Regional Specialized Meteorological Center in New Delhi started to assign names in September 2004. 30th Oct 2012 @ 18:00 hrs. It is raining incessantly in Chennai and there was water stagnation in some roads. Schools in the City and some districts have been closed as more rain stands predicted. 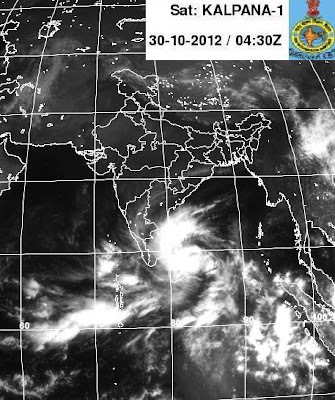 Andhra Pradesh, Tamil Nadu and Puducherry coasts face a cyclone threat, the Meteorological office said on Monday 29th Oct 2012. The Indian Meteorological Department (IMD) issued cyclone alert for north Tamil Nadu, Puducherry and south Andhra Pradesh coast. According to an IMD bulletin last night, the deep depression over south-west Bay of Bengal lay centred at about 500 km south-southeast of Chennai and 130 km east-northeast of Trincomalee (Sri Lanka). The system would intensify further into a cyclonic storm and cross north Tamil Nadu and adjoining south Andhra Pradesh coast between Nagapattinam and Nellore by Wednesday evening. With the North East monsoon being active over Coastal Tamilnadu, rainfall occurred on 29th Oct 12 at many places over Coastal Tamil Nadu and at a few places over Kerala. Isolated rainfall occurred over Interior Tamil Nadu and Coastal Andhra Pradesh. Mainly dry weather prevailed over Lakshadweep and dry weather prevailed over Telangana, Rayalaseema and Karnataka. Trangambadi in Nagapattinam Dist received 13 cm rainfall. Isolated heavy to very heavy rain is predicted to occur over Coastal Tamil Nadu and Puducherry during the next 48 hours. The forecast for Chennai city for the next 24 hours reads : The sky conditions would be generally cloudy. One or two spells of rain or thundershower would occur. Surface winds will be strong and gusty at times. Maximum and minimum temperature would be around 30 and 26 degree Celsius respectively. Arising out of the well-marked depression over southeast Bay of Bengal, South coastal Andhra faces the threat of a cyclonic storm hitting the coast in the next 2-3 days. Ports at Krishnapatnam, Nizampatnam and Machilipatnam hoisted the cautionary signal number one, as the deep depression is all set to turn into a cyclonic storm in the next 24 hours. The depression lay centered about 850 km southeast of Chennai and 550 km southwest of Port Blair. Weather officials said the system would move northwestwards and cross north Tamil Nadu-south Andhra coasts between Cuddalore and Nellore in the early hours of December 29. The present rain fall is occurring under its influence. In Andhra, mercury has dipped at several places in Vizag in the last two days with Chintapalli and G K Veedhi mandals recording 3 degree Celsius. Lambasingi village in G K Veedhi recorded a low of 0 degree Celsius on Sunday, while several interior villages are reeling under intense cold spell in the last couple of days. 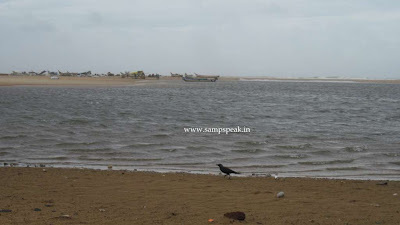 While rain & swally winds reaching 45 to 55 kmph that are forecast in coastal Tamilnadu; the authorities in Andhra Pradesh have sounded high alert along the south coast and also in adjoining Rayalaseema region. 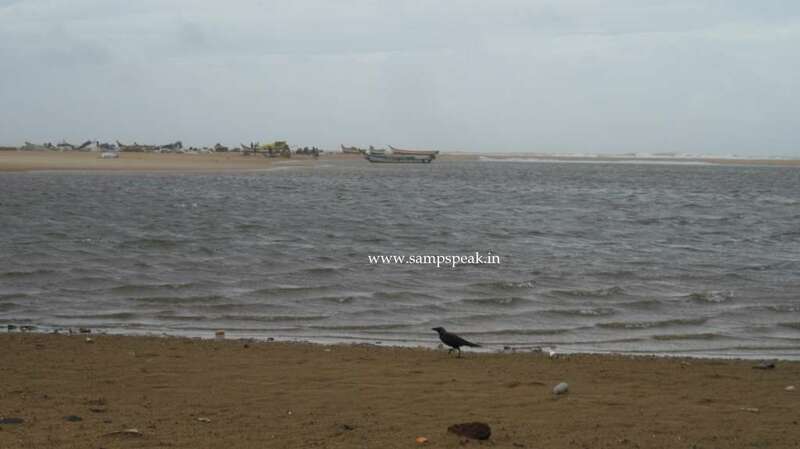 Nellore district administration has advised people in the low-lying areas near the coast to move to safe places. The districts of Guntur, Prakasam, Krishna, West Godavari and East Godavari have also gone on high alert. The officials have asked fishermen, who had gone in high seas, to return to the coast immediately. The authorities have also set up control rooms in Nellore and Ongole in Prakasam district to monitor the situation. Sure you have seen lot of way-side eateries and perhaps this one by name ‘AVM Homely Food’ under a thatched roof would pass off as just another one. 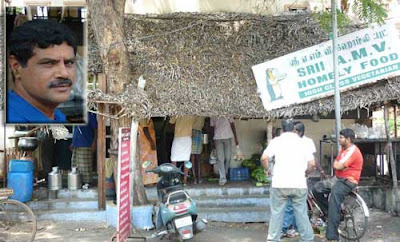 You can find similar looking eateries everywhere and that way this one run by a gentleman called Venkatraman could be insignificant but not anylonger, once you read this report as it appeared in Dinamalar. Mr Venkatraman runs this small time hotel nearer the Government Hospital at Erode on the Powerhouser road. Being a rural area, the scene around hospitals would more or less be similar – one can find people not even wearing chappals, with old looking clothes, with concern in eyes and a bag in the hand wandering around. When villagers gets afflicted with some diseases, the biggest hospital they can think of, are the ones – the Govt. hospitals at District centres. In a World, where luxury aircrafts run full and where you see BMW, Mercedes, Aston, Audi and more luxury cars on city roads, the life at village still remains different. The poor people who accompany the near & dear to hospitals, would not have much money left and certainly cannot afford to eat even a single square meal. The owner / the hero Mr Venkatraman in his words says that often poor people would come to the eatery, ask the price of meals – then would ask whether they would be served ‘half-meals’ [the only criteria being that it would be much cheaper] – then ask for a vada and tea or even end up just having a tea and going away carrying hunger – all because they cannot afford even Rs.25/- that would be normal charges for a reasonably good meal. 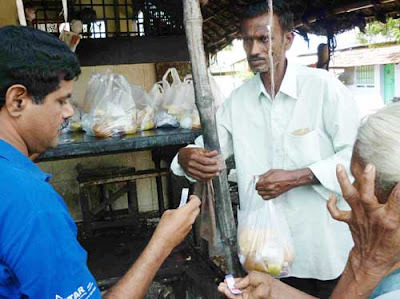 This particular eatery daily serves not less than 20 meals at Re.1/- [as people with self-dignity would not take something given free] – to ensure that it reaches only the right recipients, he ensures they bring a slip attested by the hospital authorities as somebody being admitted as inpatient and this person being their accompanying person. The meal, according to the personal experience of the writer of the article in Dinamalar is of very good quality. Mr Venkatraman who owns AVM Homely Service and runs this facility is still humble and reported as saying that ‘he would do more, when his financial position improves’. He says he further extends discounts to disabled and blind. In a World, where people try to take credit for everything, this humble man says there are persons who helps him financially on hearing of this – and he keeps a board, writing the Name of such donors. After posting this article, I felt so moved that I sent a SMS to this noble person Venkatraman, greeting him and appreciating him of his service. At first glance, you might wonder – how this is ‘so great’. You must bear in mind, that he runs a smalltime hotel – not the bigger ones that we see in the city. More importantly, in monetary terms – 20 x 25 = 500 per day i.e., Rs.15000/- per month; a whooping Rs.1,80,000/- a year – incredible that he is doing so much for the Society !! – thinking of how that amount can transform his living and yet he chose to live for the Society.. great indeed. Was pleasantly surprised when I received a call from ‘9629094020’ and our hero, humbly said ‘he felt happy on receiving a message’ and just called in to thank me for that message of appreciation. Sure would do something from my side – the least being sponsoring a day ! மதிய உணவு வேளை : ஈரோடு, பவர்ஹவுஸ் ரோடு, அரசு ஆஸ்பத்திரி எதிரே உள்ள ஏவிஎம் உணவு விடுதி அருகில், காலில் செருப்பு கூட இல்லாதவர்கள், உடம்பில் சட்டை போடாமல் துண்டு மட்டும் கொண்டு இருப்பவர்கள், ஒரு காலத்தில் வெள்ளையாக இருந்த வேட்டியை அணிந்தவர்கள், நைந்து போன புடவையுடன் காணப்பட்டவர்கள் என சுமார் இருபது பேர் அந்த உணவு விடுதி அருகே, கண்களில் கவலையையும், கையில் ஒரு பையையும் வைத்துக்கொண்டு நின்றார்கள். சிறிது நேரத்தில் உணவு விடுதியில் இருந்து அழைப்பு வந்ததும் கையில் இருந்த ஒரு டோக்கனையும், ஒரு ரூபாயையும் கொடுத்துவிட்டு ஒரு பார்சல் சாப்பாட்டை வாங்கிக்கொண்டு திரும்பினர். நீங்க சாப்பிட்ட சாப்பாட்டின் விலை இருபத்தைந்து ரூபாய், இந்த சாப்பாட்டைதான் இப்போது வந்தவர்கள் ஒரு ரூபாய் கொடுத்து வாங்கிச் சென்றார்கள், அவர்களுக்கு மட்டும்தான் ஒரு ரூபாய். அது ஏன் அவர்களுக்கு மட்டும் ஒரு ரூபாய் என்ற உங்கள் சந்தேகத்தை விளக்கிவிடுகிறேன். எங்க ஒட்டலுக்கு எதிரே உள்ள அரசு ஆஸ்பத்திரியில் உள் நோயாளிகளாக அனுமதிக்கப்படுபவர்கள் பெரும்பாலும் சுற்றுப்பக்கம் உள்ள கிராமத்தைச் சேர்ந்த ஏழை, எளிய மக்கள்தான். நோயாளிகளுக்கு மதிய உணவு ஆஸ்பத்திரியில் வழங்கப்பட்டுவிடும், ஆனால் கூட இருக்கும் உறவினர்களுக்கு ஆஸ்பத்திரி நிர்வாகப்படி உணவு வழங்கமுடியாது, அவர்கள் வெளியில்தான் சாப்பிட்டுக்கொள்ள முடியும், அவசரமாக வந்தாலும், நிதானமாக வந்தாலும் அவர்கள் கையில் காசு இருக்காது. Can a person be faulted for being consistent and behaving as he is ? - then why is this person faulted. On screen, the hero when confronted with wrong, folds his tongue, gets angry, eyes turning red would talk gesticulating his anger. Desiya Murpokku Dravida Kazhagam (DMDK), the political party of Tamil film actor “captain” Vijayakanth seems to be in serious trouble with four MLAs meeting with the AIADMK leader and chief minister J Jayalalithaa. The DMDK has 29 MLAs in the Assembly and Mr. Vijayakant is the Leader of the Opposition. Though the DMDK and the AIADMK were part of the same alliance for the 2011 Assembly elections, they fell out subsequently in the wake of a war of words between Ms. Jayalalithaa and Mr. Vijayakant. The DMDK went alone in the local body polls and fared poorly. Factually, they are the primary opposition party in the State above DMK & Congress, its president Vijayakant is taking on the ruling AIADMK on various fronts- whence two of his party MLAs followed by another couple called on Chief Minister Jayalalithaa and lauded her government’s performance. R. Sundarrajan, representing the Madurai Central Assembly constituency, and K. Tamil Azhagan elected from the Tittagudi reserved constituency, met Ms. Jayalalithaa and sought her help in the implementation of development projects in their constituencies. The meeting was held at the Secretariat on Friday morning. More was to follow the next day with actor C. Arun Pandian, who was elected from the Peravurani constituency in Thanjavur district, and Michael Royappan, a film producer, representing Radhapuram constituency in Tirunelveli district, called on Ms. Jayalalithaa at her Poes Garden residence. Typically they hailed the CM for the various welfare schemes an described their meeting as seeking more for their constituencies. To a question whether they had joined the ruling party, they retorted that they had come to make a representation before the Chief Minister regarding their constituencies and added “We will support all the good measures of the government.” Mr. Sundararajan was quoted as stating that he need not seek permission from party founder Vijayakant to meet Chief Minister Jayalalithaa. If more warm up to the AIADMK and all of them switch sides, the DMDK will lose its status of the opposition party to the DMK which has 23 seats in the assembly. For those not actively following Tamilnadu politics, DMDK [Desiya Murpokku Dravida Kazhagam] is a party floated by actor Vijayakanth in Sept 2005. Vijayakanth’s original name was Chandrasekhar and his father Alagarswami was Madurai's Councillor for two terms. His nickname in film industry is Captain" and "Puratchi Kalaignar". This party contested in all 234 seats in the state elections in May 2006 with Vijayakanth contesting in Vridhachalam. The party polled almost 3 million votes (about 10% share). All the candidates of the DMDK with the exception of Vijayakanth lost the elections in 2006. Vijayakanth, once a DMK sympathiser, was bitterly anti-Karunanidhi and hence AIADMK had no difficulty in teaming up with him for the 2011 assembly elections. In the 2011 Tamilnadu elections, his party DMDK won 29 seats out of 41 contested seats and he became the leader of the opposition. The present signs of a possible defection could have been the result of some underground political maneuvering by the AIADMK. DMDK is largely family driven, with his wife and brother-in-law sharing its control with him; and the voter-base mostly comprises his fans and followers, it remains to be seen if a split in the party can indeed destabilise him and weaken his constituency. In the present political systems, most parties ensure that the MLAs are virtual nobodies, so that a defection or split might not mean much to the party’s electoral influence. It is not the first time that Captain has landed himself in trouble due to intemperate public behaviour. On Saturday, local TV channels had a field TV showing clips of his ‘losing temper’ with some reporters at the Chennai airport when they pursued him with questions on the possible split in his party. The popular, evil-fighting mass hero was shown as angrily retorting and one of his aide pushing a reporter aside with alleged threats, foul-mouthing those around. The altercation made up a good comedy show of the otherwise mass hero. Newspaper reports state that the trouble began when Vijayakanth, accompanied by his wife Premalatha and DMDK MLA 'Anagai' Murugesan, came to the airport to board a Jet Airways flight to Madurai. Soon after he alighted from his car, media thronged him to seek his reaction about four of his Party MLAs calling on AIADMK Supremo. At this stage, one of the scribes pulled his hand in a bid to bring him to have a sound byte, leading to an altercation. Vijaykant was depicted as stating it was not a national or an important issue to be discussed. "There are much more pressing issues like prevalent of Dengue and unannounced power cuts in Tamil Nadu which needs to be discussed,"
When the reporter reportedly drew his attention to the rampant power cut in Rishivandhiyam Constituency from where he was elected, a visibly upset Vijayakanth, with folded tongues, asked from which media he was representing. As the journo did not reveal his identity, the MLA with him pushed the scribe and also tried to assault him. Vijayakanth is also said to have unleashed some abuses. The scribe has filed a complaint with the airport police although it is not sure whether it names the leaders. The media outfits said the manner in which Vijayakanth abused the journo did not behave well to the position of the Leader of the Opposition held by him. The Society can be pardoned if they are not given the due respect – but why many a times they receive much less that what even wrong-doers get !!! Whenever a criminal is killed in an encounter, many groups spring up trying to pick up holes in the narration of Police, asking too many Qs on why the killing was done, why capturing them instead was not resorted to – these people in the garb of Human Rights start posing as if they know and understand everything and keep raising Qs supporting the criminals. There have been debates on whether there should be ‘capital punishment’ – most times they spring up when the punishment is meted out as a punishment to the ‘rarest of the crimes’ much against the humanity. – but how many raise their voices when a Police man is attacked, worser still when one is killed by a rowdy element. Is it not the duty of the Press, Human Right protectors and common public to condemn such killing. Death, a ghastly murder at that, occurred to Mr T Alwin Sudhan Sub-Inspector of Police who was stabbed to death; two Constables sustained severe stab injuries in an attack by an armed gang at Vembathur in Sivaganga district. The deceased SI was only 27, prime of his youth. Police sources said the deceased T Alwin Sudhan (27), Sub Inspector of Police attached to Thirupachethi Police Station, and the two constables were camping at Vembathur on a bandobust duty for the "Marudu Pandiyar Guru Pooja." On receiving information about a group clash, the trio rushed to the spot, where they were encircled by an armed mob which stabbed the Cops. While Alwin Sudhan died on the spot, the two constables were rushed to the Meenakshi Mission Hospital and Research Centre at Madurai. The mob also attempted to attack a Deputy Superintendent of Police (DSP) Karunakaran, when he attempted to save the Cops. Director-General of Police K. Ramanujan rushed to the place and paid homage to the slain policeman. Placing a wreath on the body of the officer at the Government Rajaji Hospital mortuary here, the DGP expressed condolences to the bereaved family members. Describing the incident as unfortunate, Mr. Ramanujan, however, said that the police would secure the accused gang soon. “We have formed teams…Already a few suspects are being interrogated. The whereabouts of the key accused are also gathered,” he told mediapersons. Chief Minister Jayalalithaa ordered a compensation of Rs. five lakh to the dependents of the Sub-Inspector of Police and Rs one lakh each to the head constables. State Ministers Sellur K. Raju and Rajendra Balaji placed wreaths on the slain police officer and expressed condolences to the bereaved family members. They also called on the two policemen in the private hospital here. Further reports suggest that Police have identified a youth from Puthukulam village in Sivaganga district as the prime suspect in the murder of Alwin Sudhan on Saturday . It is stated that Prabhu, a native of Puthukulam near Tirupachethi, was the one who stabbed the sub-inspector. Twenty-six others, including Prabhu's friends Bharathi, Ayyanar, Muthupandi and Kumar also hailing from the same village were also involved in the attack against the SI and two constables, police said. Based on a complaint from DSP Karunanidhi, a case of murder has been registered against them. A criminal daring to attack an uniformed Police official certainly does not augur well for any civilized Society. The Board of Control for Cricket in India (BCCI), headquartered at Mumbai, India, is the national governing body for all cricket in India. The board was formed in December 1928 as BCCI replaced Calcutta Cricket Club. BCCI is a society, registered under the Tamil Nadu Societies Registration Act. As a member of the International Cricket Council (ICC), it has the authority to select players, umpires and officials to participate in international events and exercises total control over them. Without its recognition, no competitive cricket involving BCCI-contracted Indian players can be hosted within or outside the country. India crashed out of World T20 ICC tournament held in Sri Lanka recently and in the Champions League now underway – IPL teams fared badly with only Delhi Daredevils earning a berth in the Semi finals. Now England is to tour India for 4 tests and there would more of the five day longer version of the game. The connoisseurs of five-day cricket who always believes that it is the ultimate joy were rocked with the abysmal performance of the Team in England and in Australia. Still, the 0-8 has not have generated the kind of debate, and corrective action, we would have liked. We have a new Selection committee under the helm of Sandip Patil and theoretically the non-performers must be chopped making way for new prospects. If not to regain the No. 1 slot, at least to bounce back, some sweeping changes are essential. There are many players who have been taking their place for granted and performing less than ordinarily. Every now and then you hear of Munaf Patel and even RP Singh could stage a come back ! – our batting woes are confounded – no Dravid, no Laxman, Sachin making his critics speak on his retirement, Dhoni not scoring, Sehwag unsure, Gambhir sure of edges and more. India has problem at the top, middle order and the late middle order – the tail-enders succumb without fight. Selectors need to balance and have the best talent ready for 2013 in South Africa and thereafter for New Zealand, England and Australia. May be time, we thought of different Captains for Tests / One dayers / T20s as also the team – which should not rely only on Virat Kohli to deliver. The pace bowling cupboard is more bare – Zaheer is a pale shadow of the past and Irfan Pathan is no replacement, but the one who needs to be replaced. Pragyan Ojha and R Ashwin have been excellent at home (Ojha 63 wickets in 12 matches, Ashwin 40 in five!) but outside the subcontinent, you are not going to get this support and pace bowlers must learn to take wickets at least on helpful tracks. With this background, are you aware that payment to players is regulated under an annual contract by the BCCI and that players would continue to get their remuneration irrespective of the fact whether they play in the XI or part of the squad or not !!! There are grades A, B & C - in the recent changes made by the BCCI - Offspinner Harbhajan Singh and seamer Ishant Sharma have been demoted from Grade A to B; while offspinner R Ashwin, who has become the leading spinner for India across all three formats, has been promoted from Grade B to A. This means that the duo of Harbhajan and Ishant will draw a fixed income of Rs 50 lakh (approx $93,000) each from October 2012 to September 2013, instead of the Rs 1 crore (approx $186,000) that players with the top grade of contracts will get. Wong Mew Choo, the badminton star is known for her exceptional endurance and stamina, the result of training alongside male shuttlers. She has been in news as also Lee Chong. Datuk Lee Chong Wei – also from Malaysia was ranked first worldwide for 199 consecutive weeks from 21 August 2008 to 14 June 2012. Lee is a silver medalist in both the 2012 Olympic Games and 2008 Olympic Games, thus becoming the first Malaysian to reach the final of the men's singles event and ending Malaysia's Olympic medal drought since the 1996 Games. This achievement also earned him the title Datuk, and a description by Malaysian Prime Minister Najib Tun Razak as a national hero. He repeated the achievement four years later in London, thus making him the most successful Malaysian Olympian in history. Most likely that you have a Facebook account and have the habit of regularly posting updates on your status, your pictures and expressing ‘likes’ and expecting more than what you like. The popular networking social site recently announced that it has 1 billion active users per month, and………….. almost 65 million of its users are from India, making it the second largest country on Facebook. According to sources, this represents an eight-fold jump in a span of just two years. The penetration of Internet is not very high – though even people in remote centres do access WWW to check their e-mails, post themselves on FB and various other social networking sites. Marketeers have been hoping of an Internet boom over the next decade. The total no. of internet users have been growing by leaps and bounds and the predominant among them is youngsters. It is reported that FB is planning to introduce more key products and innovations for India, both on desktop and mobiles. FB is now available in nine languages on phone and 10 languages on desktops. There are reports that as a promotion campaign, they might provide free talk time to select mobile users. This post is not about all that – but about the way to gain an invitation to the wedding of Sport stars. Chong Wei is famed in Malaysia and thousands yearn to get closer to him and to attend his marriage……… the chances of winning an invitation hinges on computerized effort !! Anyone who wants to attend the wedding of Malaysian badminton player Lee Chong Wei could be one of 10 lucky fans winning invitations by posting on his Facebook page. The Olympic silver medallist is getting married to sweetheart Wong Mew Choo on November 9 and the chosen few will be able to rub shoulders with celebrities and government dignitaries, local media reported. The competition, likely to trigger some feverish online traffic, begins on Sunday and closes on November 5, Chong Wei’s press office said. If you wish to be one, you are expected to first click ‘like’ under Chong Wei’s fan page, as also explain why you wish to attend the wedding reception at Kuala Lumpur Convention Centre. “The 10 best comments will be picked by Chong Wei and his would be wife Wong Mew Choo, based on creativity,” Sachi Choo of Chong Wei’s agency told the Bernama news agency. Results will be announced on November 6 and will be of some interest to officials from the Prime Minister’s office, Health and Trade Ministries, who have confirmed their attendance. It is not a surprise that fans of Cricket see the game and learn Politics, Geography, Worldly knowledge and more from the game. Today there are reports of this man being taken off from a New York bound plane and reportedly questioned on ‘drones’…. To unravel more, he founded a political party, Pakistan Tehreek-e-Insaf (PTI), in 1996 which emphasized on anti-corruption policies. The newly formed party was unable to win a seat during the 1997 Pakistani general election. He supported General Pervez Musharraf's military coup in 1999, believing Musharraf would "end corruption, clear out the political mafias". In May 2005, hen became one of the first Muslim figures to criticise a 300-word Newsweek story about the alleged desecration of the Qur'an in a U.S. military prison at the Guantánamo Bay Naval Base in Cuba. Recently, he reacted angrily to a statement by Nawaz Sharif that his family had paid Rs 92 crore as taxes in the year 1990, Chairman PTI said that this is a deliberate attempt at misleading the people. He said that as per FBR records the declared income of Nawaz Sharif for the year 1990-91 was only two lacs forty nine thousand five hundred and thirty seven (Rs 249,537). On this income he paid Rs fifty one thousand three hundred and eighteen (51,318) as income tax. Where has the figure of ninety two crores that Nawaz Sharif family have supposed to paid as tax come from, he thundered in public forums. Nawaz Sharif is a steel mill industrialist and business magnate, who served as the 12th Prime Minister of Pakistan in two non-consecutive terms from November 1990 to July 1993, and from February 1997 until the military coup in 1999. He is a leading steel mill conglomerate, and also one of the country's wealthiest industrialist. When India toured Pakistan prior to the World Cup in 1983, he was at his fearsome best cutting through the Indian batting line up – he played for two decades culminating with him captaining and winning the ODI World Cup at Australia in 1992 – that man is - Imran Khan Niazi – a fast bowling allrounder who later plunged to politics. He also founded a Cancer hospital and research centre in memory of his mother. One of the most illustrious players of Pakistan, he played from 1971 to 1992. He scored 3807 runs and took 362 wickets in Test cricket, making him one of eight world cricketers to have achieved an 'All-rounder's Triple' in Test matches. He is in news as there are reports that Imran Khan was taken off a New York-bound plane at Toronto; Imran claimed that he was questioned by American officials about his stance on US drone strikes in Pakistan, before he was allowed to travel by the US officials. "I was taken off from plane and interrogated by US Immigration in Canada on my views on drones. My stance is known. 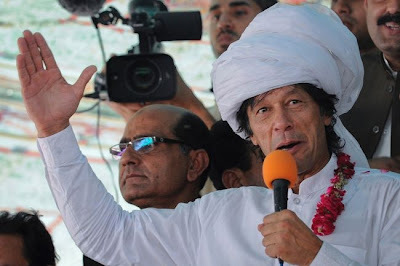 Drone attacks must stop," Khan tweeted. "Missed flight and sad to miss the Fundraising lunch in NY but nothing will change my stance. Still looking forward to meet family there," Khan said. Khan was heading for to New York to attend a fundraiser organised by his party's US chapter in Long Island. Earlier, Imran had intended to hold a demonstration outside the United Nations headquarters in protest of the US drone strikes on his country's soil. In a development not directly connected to this, it is stated that the proposed rally in NY was cancelled as it coincided with the festival of Eid and several supporters of Imran had cited their inability to participate in the demonstrations due to the Id celebrations on October 26. Gold ETF soars sky high .. crosses 11000 Cr..